The Collections are finally here and its the perfect time to grab them up. *** 4 books for the price of 1*** You can’t beat a deal like that especially if you’re missing some in the series. They will be rolling out every Monday leading up to the release of the bonus book Chloe & Eros: The Bet. Grigori Thane has been exiled to the realm of humans and Mystics for almost fifty years after what he considers a slight misunderstanding. When an unexpected visit from his Watcher brings to chance to gain his rightful place back on Olympus, he vows he will do anything to achieve it. Amara Hope is desperate to rescue her brother from Viral City. As her last living relative she refuses to let him go without a fight. When a hunky good samaritan grudgingly offers help, she’s all too willing to accept. What the two don’t know is that the Gods are playing games with their lives, and they’re on a collision course with love. Parvati Shiva, a true descendent of the Goddess of love and devotion, is having a crappy day. She runs a successful dating site, connecting Mystics and humans all over the world with their one true love. When a hacker gets into her network and website, shutting down her site in the height of the busy season, she calls on her cousin and his connections for help. Colin Patterson, IT guru and confirmed bachelor, quickly jumps on a last minute job from his ld friend. He’s eager to escape his mother’s matchmaking Valentine’s Day party and will do anything to get away. Colin’s luck ends there when he promptly ruins his chance with the beautiful Indian woman he’s instantly attracted to. Will he be able to prove he isn’t a boss bashing idiot, save Parvati’s company, and win her affections before he doesn’t have a reason to stick around? Please note: This book has a hot M/M scene. It does not involve the hero of this story. Gideon Deckard is finally getting a little time away from the Keystone Predator Pack to go wolf. All he has planned is a week of running wild through the Grand Canyon before the hiking season starts back up. Once it does, he’ll go back to what he does best…being the Alpha he was born to be. Ryder Sparks can barely contain her excitement. She’s going on her dream vacation hiking through a lesser traveled trek through the Grand Canyon. She’s looking forward to pushing herself on her first solo trip and discovering who she was really meant to be. A run in with a massive grey wolf throws her plans out the window. When she wakes up, she’s back in her tent and there’s a hunky man there to help her get back on her feet. When she finds out he’s a wolf-shifter instead of freaking out, she decides to go on the adventure of a lifetime with him. Now all she has to do is convince Gideon to give her a chance to be his one and only Luna. For three years Lisa Cannon has been at Jack Morgan’s every beck and call. As his executive personal assistant it’s in the job description, except she’s beginning to think she’s gone above and beyond the call of duty. She hasn’t had time off in so long she’s pretty sure her nymph side is dying a slow death inside. After arranging for a week away, she’s set to feed her nymph with every sexual fantasy that comes to mind. Jack knows he shouldn’t do it but does anyway. He cancels his assistant’s vacation…again. He can’t stand the thought of her unleashing her nymph side on anyone but him. Over the past three years he’s slowly fallen in love with the petite beauty that keeps his personal and professional life running smoothly. When Lisa goes on vacation anyway, Jack knows there’s only one thing to do. 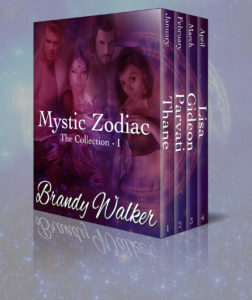 He needs to find a way into the Mystic-only club and claim the woman who has stolen his heart. Lion for Her is Here!!!! Blog Challenge – Day 8 – One Week Down!!! How will I ever make it?! !